In the wake of the brutal slaying of elementary school children in Sandy Hook, New Jersey, the country finds itself, once again, intensely debating the role gun access and gun laws play in these recurring tragedies. This tragedy in particular seems to have been a tipping-point in the national debate in that legislative action might actually succeed. The usual dynamic between Left and Right has been playing out in the same fashion for at least two decades now. It’s taken a seat right side abortion as one of the most passionate and divisive issues being raised during political campaign seasons, often becoming THE determining factor for many Americans in deciding who they will cast their final ballot for. Ever since former President Bill Clinton’s infamous “assault weapons ban” was enacted in 1994, liberals have generally favored stricter gun laws whereas moderate conservatives have argued for the status quo. However, this era also gave voice to an even more far-Right group of gun advocates who would form a coalition based on the belief that the 2nd Amendment to the Constitution of the United States specifically guarantees an unregulated right to bear arms regardless of the circumstances. This vocal group of determined and passionate fundamentalists began to wield considerable power over politicians nationwide when, in the early 90s, they seized leadership control of the National Rifle Association (N.R.A.) away from the Old Guard, whom they felt too moderate and complacent with the current laws. I will refrain from sharing my opinions on the N.R.A. and its opponents and instead focus on some peculiar statements being circulated throughout the mainstream media news outlets made by conservative gun-enthusiasts on their home network, Fox News, among other media outlets. Specifically, there are claims that 2nd Amendment rights would have protected millions of people of Jewish descent from their eventual Holocaust in Europe in the mid-20th century. Of equal interest are claims that the 2nd Amendment would have protected Black people from being taken from their homelands and being forced into the degradation that was American and European slavery. But how about the historical record, and does it really support such a conclusion? It cannot be stressed enough how completely absurd are the claims being made in the Right-wing media that recent, rather moderate, gun control measures put forth by President Barack Obama are somehow similar to “what Hitler did”. Although they are all the current rage, these claims are not necessarily unique to President Obama’s presidency. Claims that gun confiscation was part of a massive plot by the Nazis to exterminate the Jews have been around since 1982, when introduced as a propaganda tool to instill fear into the minds of Jewish voters residing in suburban Chicago over the enactment of a city-wide handgun-ban. The founder of Jews for the Preservation of Firearms Ownership (J.P.F.O.) once claimed that “law-abiding firearm owner[s] will go the way of the Jews in Nazi-occupied Europe: extermination.”  This claim was further expanded on by the N.R.A.’s executive vice president, Wayne LaPierre, in his 1994 book, Guns, Crime and Freedom, in which he wrote, “In Germany, Jewish extermination began with the Nazi Weapon Law of 1938, signed by Adolf Hitler.” Whether or not these claims are intentionally misleading or not, which I believe is likely, they are a complete fabrication of the truth. The “gun confiscation” act they presumably refer to was initially enacted in 1919, nearly fifteen years before Hitler’s rise to power, as a result of Germany’s loss in World War I. The Treaty of Versailles contained within it the demand for immediate surrender of all firearms. These laws would be relaxed somewhat in 1928, but were not fully revoked until 1938 at the same time Hitler and the Nazis were in power. Hitler’s Weapons Law did the exact opposite of what the N.R.A.’s proponents claimed it did and had the effect of loosening restrictions on the sale, trade, possession and ownership of firearms in Germany. Of course those who were not among the favored of Europe: Jews, gypsies, disabled persons and other, did not have these rights extended to them. LaPierre’s assertion that a nonexistent gun measures were, or would have been, a contributor to preventing the European Holocaust is patently false. Nazi persecution of the Jews didn’t simply happen in a vacuum. Europe’s anti-Semitism had been a reality for centuries leading up to the point, and began to rise to an even greater level in Germany following their defeat in WWI. A gun confiscation act implemented at that time would have had little effect on the Jewish people, for the great majority of Germans, indeed most Europeans, found in them convenient scapegoats for their own economic conditions and cast further blame on them for their defeat in the war. The notion that most Germans would have risen up in arms to defend their Jewish population, which history shows they did not, had they just been given more guns is an absurd flight of fantasy. There are endless lessons to be learned from the earth’s history, for as we’ve seen, history repeats itself again and again. The debate about the role guns play in our society will likely go on for decades to come, as it has been going on for centuries now. Let’s not, however, allow advocates of a particular point of view to elevate the 2nd Amendment to a saintly role with such moral certitude that it would have had the effect of stopping every single tragedy in the course of mankind. (**) For example, it is little more than propaganda when people say things like, “If the Nazi experience teaches us anything, it teaches that totalitarian governments will attempt to disarm their subjects so as to extinguish any ability to resist crimes against humanity.”  In fact, the real lesson we should learn from these experiences is that when imperialists wish to expand their capitalist rule, they will actively scapegoat the most hated of their subjects while providing others with the power and the means to subjugate, oppress and eventually destroy them. Seitz-Wald, Alex. (2013, Jan. 11). The Hitler Gun Control Lie. Salon. http://www.salon.com/2013/01/11/stop_talking_about_hitler/. Arsen, Gavin. (2013, Jan. 11). Was Hitler Really a Fan of Gun Control? Mother Jones. http://www.motherjones.com/mojo/2013/01/hitler-stalin-gun-control. Associated Press. (2013, Jan. 27). Chicago Woman Loses 4th Child to Gun Violence. Retrieved from http://news.yahoo.com/chicago-woman-loses-4th-child-gun-violence-050937554.html. Sieczkowski, Cavan. (2013, Jan. 19). Danny Glover Says Second Amendment Prevented Slave Revolts, Conservative Students Petition. The Huffington Post. http://www.huffingtonpost.com/2013/01/19/danny-glover-second-amendment-slave-revolts-slavery_n_2511638.html. Zinn, Howard. A Peoples’ History of the United States. Pages 33-58; PBS Online. Africans in America/ Part 1/ Bacon’s Rebellion. http://www.pbs.org/wgbh/aia/part1/1p274.html. Quote was from LaPierre’s lawyer, Stephen Halbrook. http://www.motherjones.com/mojo/2013/01/hitler-stalin-gun-control. * There’s a huge contradiction worth noting when it comes to Right-wing action and rhetoric in regards to issues dealing with race and guns. 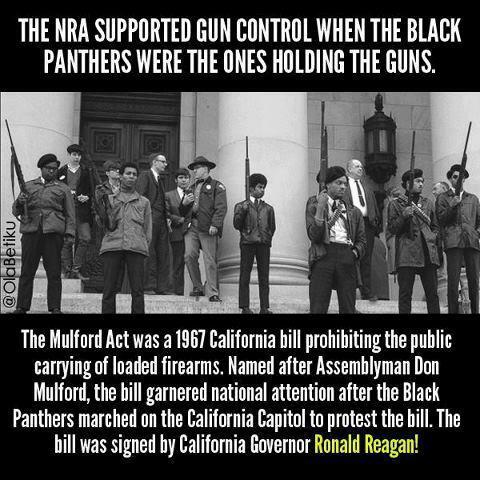 For example, when Huey Newton and Bobby Seale founded the Black Panther Party for Self Defense in the 1960’s, conservatives suddenly couldn’t change their position fast enough to express support for tighter gun restrictive measures and pass laws to the effect. This was in response to Black men declaring their constitutionally supposedly guaranteed right to form a militia to defend their communities against the white terrorism daily carried out by the Oakland police department. But now when gun violence is mainly perpetuated in the poverty-stricken inner cities, we hear conservatives calling for equal gun rights! But they express little concern when it comes to street violence where there aren’t any perceived white victims nor do they express any concern over the thousands of Black men murdered by police every year. ** In fact, conservatives are most often heard to say, “Guns don’t kill people. People do.” So the logic needs to be applied in this historical context to. slaves of the ARMED.—–the unarmed will be _________ ! While there is certainly some truth to what you said, I personally cannot go so far as to advocate arming every single man, woman, and child. The manufacturing of more guns will inevitably lead to more deaths down the road. But I won’t pretend I have a solution to the problem. A lot of ppl have argued it’s best to arm the “good guys” and not “the criminals”, but who can truly differentiate between the two? Columbus for example certainly was not classified as a “criminal” in his day, while Natives and Africans who defended themselves or rebelled against the slave system were. It’s a very complicated issue which for once I don’t have a definitive opinion about.